A perennial, creeping succulent herb, rooting from distinct node originally from South America. This is a garden escapee which has spread widely in Australia. Grows vigorously, layering and smothering low native ground covers. It is shade tolerant and moisture loving. 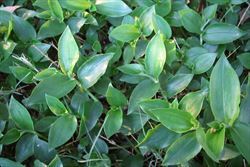 The glossy leaves are alternately arranged and their bases form short sheaths 5-10cm long, around the creeping stems. The somewhat fleshy (semi-succulent) leaf blades 3-6.6cm long and 1-3cm wide, are dark green on top and often slightly purplish underneath. They may be either broadly lance-shaped, egg-shaped in outline or oblong with entire margins and pointed tips. Leaf sheaths can be either hairy or hairless, while the leaf blades are hairless, or occasionally with some small hairs along their margins. Small white flowers 1-2mm with three petals and six hairy stamens in Spring-Summer and these flowers are borne in small clusters near the tips of the branches, each cluster has two small leafy bracts at the base and the individual flowers are borne on stalks. 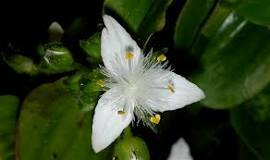 They have three white petals with pointed tips, three greenish sepals and six small yellow stamens. Flowering occurs mainly during spring and summer. The fruit are small capsules with three chambers. However, this species is not known to produce viable seed in Australia. It is a weed of forests, forest margins, urban bushland, open woodlands, riparian vegetation, roadsides, ditches, waste areas, disturbed sites and gardens...... sounds as if it does well and a very broad spectrum of conditions. It does prefer damp and shaded areas in temperate and sub-tropical regions, but will also grow in more open habitats and in tropical regions. This plant only reproduces vegetatively in Australia, by producing roots at the joints (or nodes) of stems that come into contact with the soil (stolens). Stem fragments easily break off and may be dispersed by water, vehicles, machinery, in dumped garden waste or contaminated soil. Removal can be difficult but for relatively small infestations can be removed by hand making sure that all fragments are removed to prevent it from re-shooting. A follow-up weeding will be essential as it is just too difficult to remove every single piece of this weed. Where the weed has formed a thick carpet, first rake back the bulk of the growth and then undertake follow up hand removal. Place all plant material in a bag for disposal, or stockpile the plant material under a pegged down sheet of black plastic and allow to compost. A foliar spray made up of a surfactant and glyphosate at 20ml per litre of water in winter or early spring. Apply twice 6-8 weeks apart and repeat applications are essential.